Router Analysis testing results for the Cisco ASR 1000. The Cisco ASR 1004 performed within Cisco’s claimed specifications when tested at the Router Analysis test lab. Featureless IPv4 forwarding performed better than advertised: forwarding at 27 Million packets per second (Mpps) versus the claimed 23Mpps. Featureless IPv6 forwarding was tested at 21Mpps. 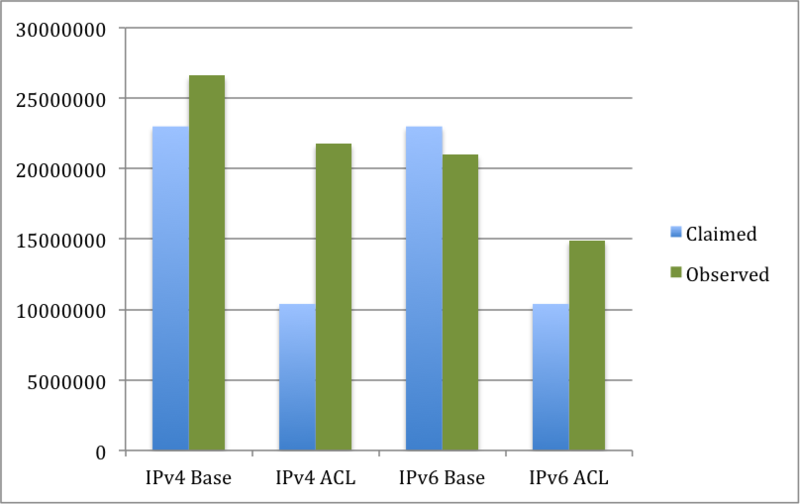 Enabling features such as ACLs and uRPF dropped the routers forwarding performance down to 23.4Mpps for IPv4 and 11.7Mpps for IPv6. Both numbers are above the 10.4Mpps minimum forwarding rate of the system advertised by Cisco. QoS functioned as expected, protecting streams as configured and no head of line blocking was observed. As a replacement for the 7200VXR, the ASR 1004 performs well. Providing the features, bandwidth and interfaces needed. The Router Analysis test lab utilizes the latest in IXIA testing hardware. The tests in this report were performed using an IXIA testing chassis with 22 Gigabit Ethernet ports, two 10 Gigabit Ethernet ports along with IXIAs IxNetwork, IxLoad and IxAutomate software. The ASR1004 was configured with one RP2, one ESP40 and two SIP40 carrier cards. Each carrier card had three five port Gigabit Ethernet v2 SPAs and one Single Port 10 Gigabit Ethernet v2 SPA. The main takeaway from the results is that the ASR 1004 performed above the quoted specifications for featureless IPv4 based forwarding. IPv4 + uRPF also came in above the stated 23Mpps specification. IPv4 forwarding with ACLs was 21.3Mpps (about the same as IPv6 base which is 21Mpps).